An example of a papal tiara. Contrary to William Branham's claims, no tiara has ever been inscribed with the phrase Vicarius Filii Dei. William Branham stated that he had been to the Vatican in Rome and had seen the following inscription above the throne of the Pope - VICARIVS FILII DEI. Is this true? If it isn't true, then William Branham was lying. The earliest record of a Protestant writer addressing the phrase "Vicarius Filii Dei" is Andreas Helwig in 1612. In his work Antichristus Romanus he took 15 titles in Hebrew, Greek, and Latin and computed their numerical equivalents in those languages, arriving at the number 666 mentioned in the Book of Revelation. Out of all these titles, he preferred to single out Vicarius Filii Dei, used in the Donation of Constantine. Some later Protestant figures claimed that Vicarius Filii Dei was an official title of the Pope, with some saying that this title appeared on the papal tiara and/or a mitre. The most plausible name we have ever seen suggested as containing the number of the beast, is the blasphemous title which the pope applies to himself, and wears in jeweled letters upon his miter or pontifical crown. That title is this: Vicarius filii Dei: “Vicegerent of the Son of God.” Taking the letters out of this title which the Latins use as numerals, and giving them their numerical value, we have just 666. Thuse we have V, 5; I, 1; C, 100; (a and r not used as numerals;) I, 1; U (formerly the same as V), 5; (s and f not used as numerals;) I, 1; L, 50; I, 1; I, 1; D, 500; (e not used as a numeral;) I, 1. Adding these numbers together, we have just 666. And, here, I’d go in there and pick up the notes. I’d pick up books of Dr. Smith, Uriah Smith, and, oh, all the—the writers and everything, and read in, read down in their books. Catholics have responded to these Protestant claims by noting that "Vicarius Filii Dei" has never been an official Papal title. 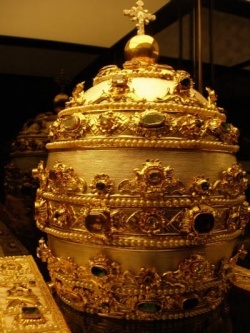 They also answer the claims that "Vicarius Filii Dei" is written on the Papal Tiara by stating that a simple inspection of the more than 20 papal tiaras still in existence—including those in use in 1866 during the reign of Pope Pius IX when Uriah Smith made his claim—shows that none have this inscription, nor is there any evidence that any of the earlier papal tiaras destroyed by invading French troops in 1798 had it. Well, it isn’t over…the Latin—the Latin words isn’t over the Vatican City; it’s over the throne of the pope, where he sits on his throne. It’s wrote up there, “VICARIVS FILII DEI.” If you wish to, in the morning, I’ll bring it wrote out, everything, and put it on a piece of paper. And if you want it, why, I’ll bring it to you in the morning. Where you can spell it out in Roman letters, VICARIVS FILII DEI, the word means “Instead of the Son of God”; he is the successor to the Son of God. The Catholic church believes that “Peter was the first pope; he was the successor of Jesus Christ.” Which that’s an error! All right. Then they claim that “Every pope following him is a successor; and the pope now, that is now, is a successor of Jesus Christ.” And there it’s wrote up over there, “A successor of Jesus Christ, ‘VICARIVS FILII DEI,’” wrote on there. Take the Roman letters and just write it (X for ten, V for five, and so forth like that), as you spell “VICARIVS FILII DEI,” and draw a line, and you got six hundred and sixty-six. Write it out and find out. Now, I got the Facts Of Our Faith, it’s called, in the Catholic church, ’cause my people were Irish Catholic. So I know what I’m speaking of. See? I stood right there in the Vatican City and verified it with the Bible. The pope wearing a triple crown, Vicarivs Filii Dei, all those things which I’ve heard and so forth, it’s absolutely the truth; a religious group that governs every nation under the Heaven, and it does. There it is, it’s so. How did I know Rome set on seven hills? How did I know the pope had VICARIVS FILII DEI? Had to take somebody else’s word for it. How did I know the triple crown was on the pope; the jurisdiction of the vicar of Heaven and earth and hell? How did I know it till I went and seen it? Now, go on over here in Revelations 13, and show you that this man sets on a city…in a city, and the city sets on—on seven hills. And the numbers of the beast is six hundred and sixty-six, wrote out in the—in the Latin…Roman alphabet, is six hundred and sixty-six, is VICARIVS FILII DEI, which is, “In stead of the Son of God,” on a pope’s throne. And his chair, got a triple crown. And I’ve looked right at the crown, stood as close as my hand is to my face, like that, and—and seen the decked crown of the pope right there in the Vatican, myself, stood and looked at it, be sure I know what I was talking about. “He opposes, himself above all that’s called God, all the godly men. He’s the holiest of all of them; sets in the temple of God, just showing himself he is God,” forgiving sins on earth, and so forth, you know. Sure. ↑ Vauchez, Andre (2001). Encyclopedia of the Middle Ages. Routledge. p. 445. ↑ Uriah Smith, Thoughts, Critical and Practical, on the Book of Revelation, Second Edition, Revised (Battle Creek, MI: Steam Press of the Seventh-day Adventist Publishing Association, 1875), 240–241. This page was last edited on 8 June 2018, at 20:53.